A volunteer ‘meet and greet’ initiative to welcome and assist patients is being introduced at Queen Margaret Hospital. 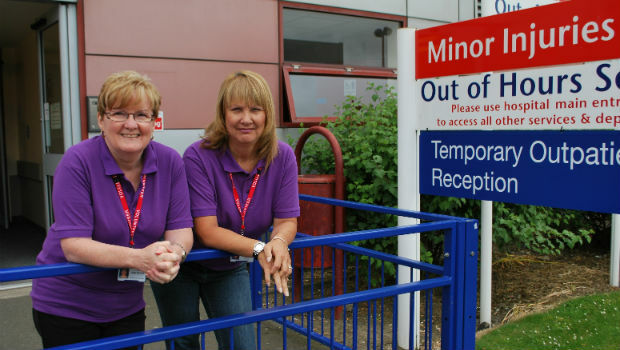 The greeters, who are currently based at the Minor Injuries and Temporary Outpatients entrance, will provide a friendly face, assisting patients and visitors at what can sometimes be an anxious time. Greeters will be based at the Minor Injuries and Temporary Outpatients entrance two days a week, with plans to increase this in the coming months as more volunteers take part. Following completion of the redevelopment work at the main entrance and reception, the greeters will move to the main reception area. Anyone who is interested in becoming a greeter or in other volunteering opportunities with NHS Fife can contact Liz Nicol, NHS Fife Volunteer Co-ordinator, on 01592 729971 or email elizabeth.nicol@nhs.net for further information.